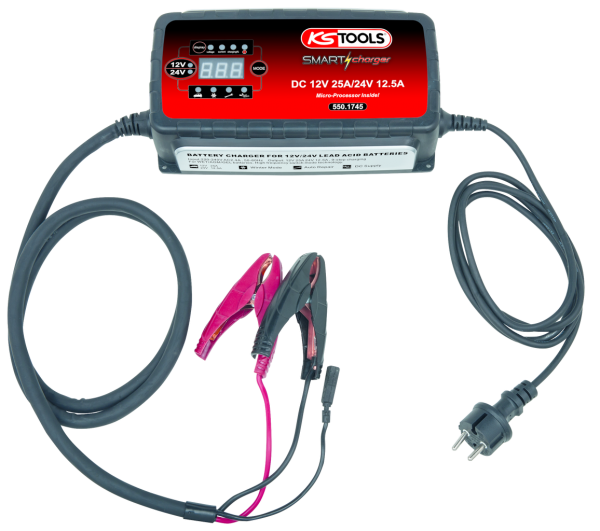 Tool specialist KS Tools have a new high-frequency battery charger for regular use in their product range. The intelligent professional charging equipment with the name SMARTcharger for 12 and 24 volt batteries has a large array of equipment features at a moderate price. The equipment is particularly safe to use as it has an integrated overload and reverse voltage protection. A precise charge controller switches to maintenance mode once charging is complete thereby preventing damage to the battery from so-called bloating or even an explosion of the energy source. The equipment is suitable for lead-acid, gel, wet cell, MF, VRLA, calcium, AGM and deep cycle batteries. The KS Tools product number is 550.1745. „Especially now in winter, a good charger is indispensible“, explains the KS Tools project management. „Because battery failure is the order of the day in cold weather.“ A microprocessor deals with the precise charge control which also prevents overloading. It switches automatically to maintenance mode as soon as the battery is fully charged. Furthermore, the equipment automatically recognises a deep discharged and/or sulphated battery and commences a repair program automatically. 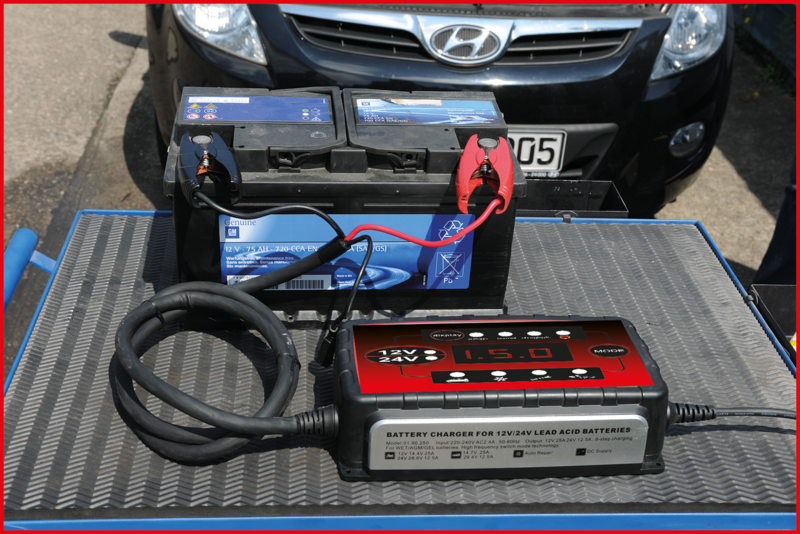 If the battery is not yet irreparably damaged, it can then achieve a basic charge state once more. The charger then automatically begins charging after repair has been carried out. The charger is equipped with a winter program which, from a temperature of under five degrees Celsius, increases the charge voltage from 14.4 to 14.7 volts or 28.8 to 29.4 volts respectively. This function, for instance, allows even AGM batteries to be charged correctly. The new charger is particularly safe due to the integrated overload and reverse voltage protection. It can also be permanently connected to a vehicle, even with the battery installed. After a power failure, it switches itself on again automatically. Using the „Supply“ function, the on-board network power supply can be guaranteed during a battery change whereby radio code and driver comfort settings etc. are maintained. A charge control light and an LED display simplify operation of the equipment. The three-digit display indicates voltage, current, charge percentage, charge state and error codes. Thus the user can follow exactly what the equipment is doing at a glance. Further convenience is provided by an external temperature sensor. It enables the automatic adaptation of the charging curve to the outside temperature. The motor vehicle professional simply selects the operating mode by means of a mode button. The high performance charging equipment is robustly housed in impact resistant polyethylene. It is supplied inclusive of crocodile clips and spade connectors. It is suitable for use with passenger cars, as well as motorbikes, vans and pickups, motorhomes, boats, fork lifts and agricultural machines. Abonnér på det gratis KS TOOLS nyhedsbrev og gå aldrig mere glip af nyheder eller kampagner. Alle priser er ekskl. moms. * Sale to registered resellers only.